Overall sales of mobile phones dropped last quarter as consumers held on their current devices during the challenging economic climate. Research firm Gartner suggested on Tuesday that in addition to financial reasons for slowing phone sales, consumers may be holding out for newer phone models expected later this year. 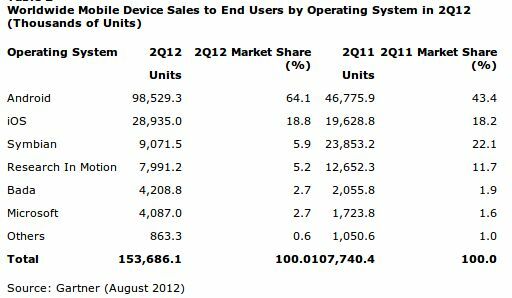 Even with the overall market decline, however, Android phones boosted their market share over the same quarter in 2011. Worldwide handset sales declined 2.7 percent, says Gartner, when comparing the second quarter sales of 2012 to the year-ago period. The decrease is due to far fewer feature phones sold, however, as smartphone sales growth surged 42.7 percent. And the Android(s goog) platform took the lion’s share of those smartphone sales, possibly because some may be holding out for a new iPhone(s aapl) model, expected as early as next month. Android’s overall market share for the second quarter jumped to 64.1 percent in 2012, compared with 43.4 percent in the year-ago period. Apple’s iOS still grew, but only marginally: up to 18.8 percent of all smartphones sold between April and June as compared to 18.2 percent a year ago. Both platforms grew their share at the expense of the Nokia(s nok) and Research In Motion(s rimm), as Symbian and BlackBerry phone sales continue to plunge. Indeed, the relative newcomer to this market, Microsoft’s Windows Phone(s msft), sold slightly more than half of the number of BlackBerrys RIM sold last quarter, says Gartner’s data. Interestingly, iOS and Android phones share a similar problem that can affect their sales. For fans of Apple, phone purchases are often a waiting game as the company typically offers a new handset model every 12 to 15 months. New Android devices, on the other hand, can appear on a weekly basis, leading consumers to either hold off for the “next hot phone” or buy a current model and be slightly disappointed when something slightly better comes along.